Home-office furniture should be organized and professional to ensure you can be as productive as possible. Many people have dedicated office space at home – perfect for those working remotely full time and for those who regularly bring their work home with them. Choosing your home-office furniture wisely can be the difference between finishing your day’s work or not. It’s also important to consider the comfort of a work partner or visiting clients. 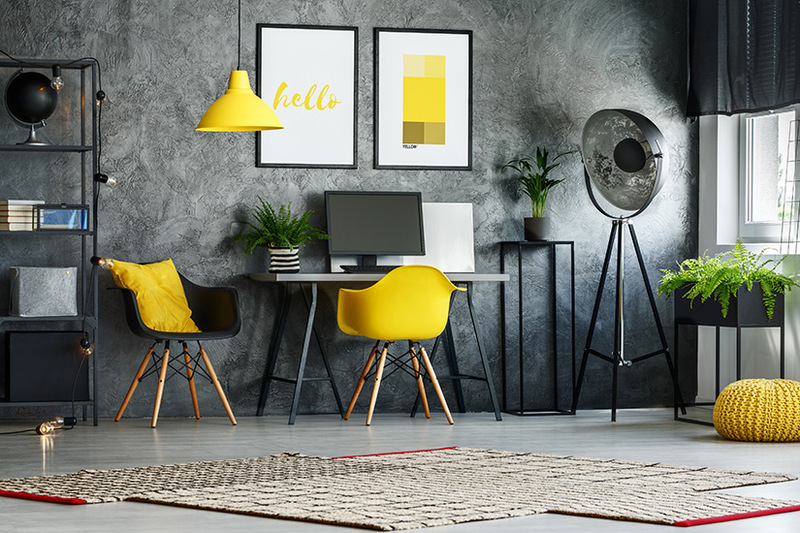 When setting up your office, you should determine how often it will be used, the style of furniture you prefer, and how much space you will have for each piece of furniture. It’s important to have enough space to place your essential furniture pieces. Space can be limited in a home office, particularly if you need all the extras, such as a printer or filing cabinet. Choosing an appropriate desk size is a good start, while furniture placement is critical for comfort. A small desk will get lost in a bigger office, and it can make sitting at it uncomfortable. A large desk can be unwieldly, and it can swamp the rest of the room. Finding a balance between the two can help, but you should have room for every item you need. Some say your desk should be 152 cm wide and 76 cm deep, but those needing an advanced workstation (especially professional designers) will need more space than that. Placing specific pieces of furniture in key locations is important. The desk should be in a location where you can see the door and face anyone else who may be in the room. Try to locate your guest chairs with their backs or sides to the window. This allows you optimal view of the outside. Going with classic, wooden furniture can anchor your workspace. If you anchor with wood pieces, then make sure you accent the room with uber–modern items, like metal shelves or metal end tables. Balancing both will make sure your office maintains that antique look, while blending in some sleek design pieces. Don’t be afraid to personalize your office. You can add a favourite chair, couch, or even a quality piece of décor. Just make sure you’re not taking up needed space unnecessarily. Contemporary furniture is stylish and if done right, can also make a room inviting and inspiring. Unlike classic, wooden furniture, modern items are often adjustable or extendable, making them ergonomically friendly. They tend to be most comfortable for long-term seating. If you use your dedicated home office often, or you work for long periods of time, then you should maximize usability and ergonomics. Having a desk at the right height and a chair that allows for good posture are extremely important components to long work sessions. No matter the material or style you choose, your furniture must be comfortable – something you can sit in for hours on end. Remember: contemporary furniture can often be adjusted, but some prefer the feeling of a classic chair and desk. Your chair type and required accessibility is something you should investigate should you or a client have any physical needs. You should be comfortable in your home office – as should partners and clients.